Join us on Tuesday, April 17th for an event addressing a key public health and health care issue facing all New Yorkers. Our forum, New York State Single Payer Healthcare? Economics, Politics and Prospects, will take place from 9am to 11am (coffee and networking from 8:30am to 9am) at the CUNY School of Public Health, Room 708, 55 West 125th Street, New York, NY 10027. 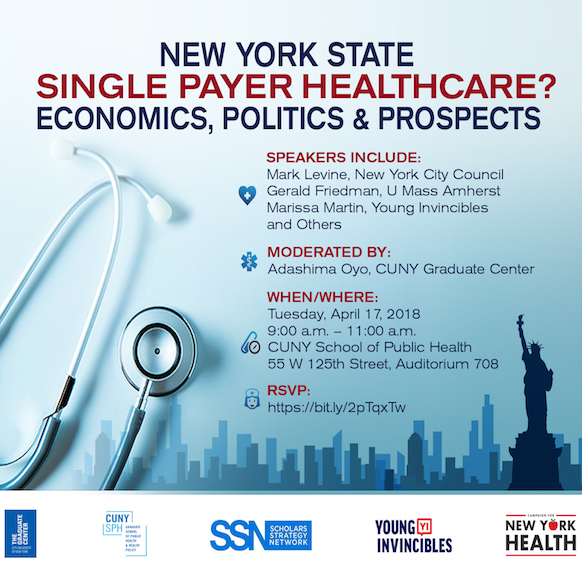 Through this forum, we hope to engage policy makers, advocates, health professionals and academics in a dialogue on the prospects for single payer in New York State. The event is sponsored by the New York City chapter of the Scholars Strategy Network, Young Invincibles, Campaign for New York Health, the CUNY Graduate School of Public Health and Health Policy, and the CUNY Graduate Center PhD Program in Social Welfare. Speakers include Gerald Friedman, an economist who has analyzed the New York State plan passed by the NYS Assembly; Mark Levine, the new chair of the Health Committee of the NYC Council; Marissa Martin of Young Invincibles, a group that organizes millennials around policy issues; and others. The forum is free but seating is limited so RSVP soon!